•Samuel Reed, 38, of 2301 Arbor View Circle Drive in D’Iberville, Miss., was arrested on June 15 and charged with attempted murder/first degree (2 cts.). •Demorial Hicks, 29, of 745 Turtle Creek Lane in St. Rose, was arrested on June 15 and charged with theft over $500. •Russel D. Hearn, 32, of 14197 U.S. 90 in Boutte, was arrested on June 16 and charged with D.W.I. and improper control of a vehicle. •Randie D. Dearment, 49, of 323 Shadow Creek in El Lago, Texas, was arrested on June 16 and charged with D.W.I. and reckless operation. •William Robert Fahrig Jr., 36, of 131 Birch St. in Luling, was arrested on June 14 and charged with D.W.I., domestic abuse battery and aggravated assault. •James E. Yawn II, 29, of 1216 Fairway Drive in Kenner, was arrested on June 15 and charged with principle to attempted first degree murder (2 cts.). •Jennifer L. Reed, 29, of 10767 Lilnoe Way in Diamondhead, Miss., was arrested on June 16 and charged with accessory after the fact to attempted first degree murder (2 cts.). •Donovan J. Barker, 51, of 2284 Ferndale Ave. in Baton Rouge, was arrested on June 17 and charged with aggravated battery. •Christopher A. Hill, 28, of 242 Boutte Estates Drive in Boutte, was arrested on June 13 and charged with theft over $500, aggravated battery, aggravated flight from officer, battery on a police officer, resisting an officer and SCSO attachment. •Lindsey S. Landry, 27, of 230 Nicholas St. in Luling was arrested on June 18 and charged with D.W.I., child endangerment and improper control of vehicle. •Terrence E. Williams, 28, of 117 Terrance Lane in Des Allemands, was arrested on June 20 and charged with D.W.I. and driving in the roadway lane of traffic. •Kennon Lottinger, 24, of 345 Davis Drive in Luling, was arrested on June 20 and charged with D.W.I. reckless operation and not having a license. 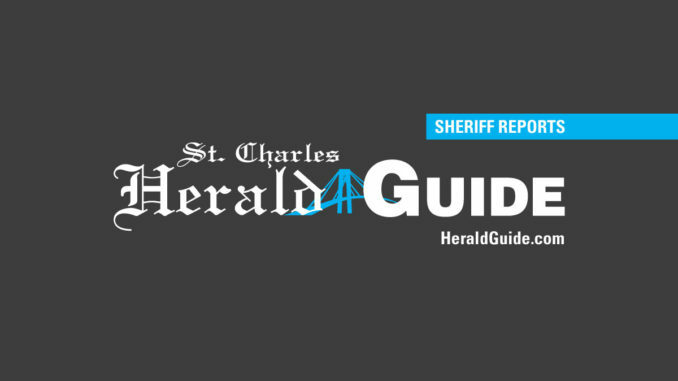 •Larry Lemar, 62, of 2344 Church St. in Vacherie, was arrested on June 19 and charged with D.W.I., reckless operation, speeding and having an open container. •Bernie Johnson, 53, of 145 S. Shaw St. in Hahnville, was arrested on June 18 and charged with D.W.I. and driving in the roadway lane of traffic. •Paul Chapman, 45, of 411 Avenue D St. in Bayclifs in Texas, was arrested on June 20 and charged with D.W.I. and having an open container. • Assorted jewelry was stolen from 121 Killona Drive in Killona on June 18. •A weed eater and a prescription of Hydrocodone, total value of $150, were stolen from 499 Estay Lane in Paradis. •A hair straightener, assorted clothing and assorted makeup were stolen out of a vehicle at 526 Steve St. in St. Rose on June 19. •Copper wire, valued at $200, was stolen from 10057 Airline Hwy. in St. Rose on June 18. •A digital camera and a video camcorder were stolen from 140 E. James Drive in St. Rose on June 18. •An MP3 player was stolen out of a vehicle at 14 Horseshoe Lane in St. Rose on June 18. •A GPS, total value of $500, was stolen out of a vehicle at 13 Bronco Lane in St. Rose on June 14. •A GPS, total value of $175, was stolen out of a vehicle at 195 Villere Drive in Destrehan on June 15. •A portable radio, semi-automatic pistol, bottle of cologne and a pair of sunglasses, total value of $4,620, were stolen out of a vehicle at 18 Corral Lane in St. Rose on June 15. •A GPS, total value of $200, was stolen out of a vehicle at 203 Villere Drive in Destrehan on June 15. •A coin operated air machine was broken into at a business at 152 Longview Drive in Destrehan on June 15. •An iPod and a driver’s license, total value of $86, were stolen out of a vehicle at 11 Cactus Lane in St. Rose on June 15. •A purse containing credit cards was stolen from 14157 US 90 in Paradis on June 14. •About $480 in U.S. currency and several credit cards were stolen out of a vehicle at 112 Tregle Lane in Des Allemands on June 14. •A GPS, set of darts and a radar detector, total value of $520, were stolen out of a vehicle at 15 Pinto Lane in St. Rose on June 14. •A GPS, beach bag, Apple Nano, debit card and Pentax camera, total value of $687, were stolen out of a vehicle from 12 Chuckwagon in St. Rose on June 15. •A pitbull, total value of $300, was stolen from 62E Brandon Hall in Destrehan on June 16. •An American Express card, GPS system, wallet and two debit cards, total value of $150, were stolen from a vehicle at 376 Evangeline Road in Montz on June 16. •A GPS, total value of $175, was stolen out of a vehicle at 350 Evangeline Road in Montz on June 16. •A CD player, total value of $350, was stolen out of a vehicle at 570 Envangeline Road in Montz on June 17. •A wallet, driver’s license and a $100 gift card, total value of $155, were stolen from a vehicle at 386 Evangeline Road in Montz on June 17. •A purse, cell phone, misc. credit cards, a bank card, check book and a wallet, total value of $414, were stolen from a vehicle at 125 Thoroughbred in Montz on June 16. •Four gold rings with diamonds and a class ring, total value of $2,700, were stolen from a residence at 423 Bernard Ave. in Ama on June 16. •An American Express credit card was stolen from a wallet at 10 Lasso Lane in St. Rose on June 16. •A speaker, total value of $30, was stolen from a vehicle at 431 Evangeline Road in Montz on June 16. •A prescription of percocet and $28 in cash were stolen from a residence in Destrehan on June 16. •A prescription of Oxycodone was stolen from a residence in Des Allemands on June 15.